The dandelion might be the most plentiful and easy to find edible plant in urban areas, if you can be assured that they are free from pesticide. Salsify and Sow thistle, which are also edible, are sometimes mistakenly called dandelions. 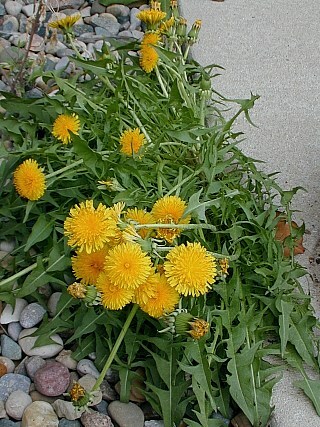 Young leaves, flowers, and the unopened flower buds of dandelions are excellent for cooking. The older leaves, especially after the plant has flowered, are too bitter to enjoy raw, but are satisfactory after a brief boiling with a change of water or two. Soy sauce compliments the natural taste of dandelion leaves quite well. The flower buds and flowers are much less bitter than the leaves, and are well suited for stir frying. The best part of cooking with dandelions is having a seemingly endless supply in the back yard. It's easy to see why dandelions were brought over as a foodcrop by settlers on the Mayflower in 1620.